The NSW government is introducing a voucher system, Active Kids, to encourage school age children to participate in sports. The voucher has a value of $100. 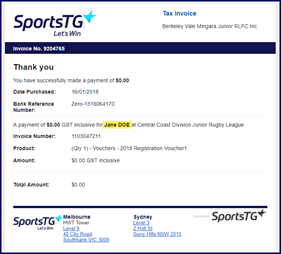 SportsTG is developing the functionality for parents to use these vouchers when registering their children. At this time, voucher capability is being offered on the FSP platform and will be made available to customers in partnership with the relevant national or state sporting organisations. 1. Who can use a voucher? Voucher can be used for registrations and equipment provided and required for competition. 2. How are the vouchers applied? 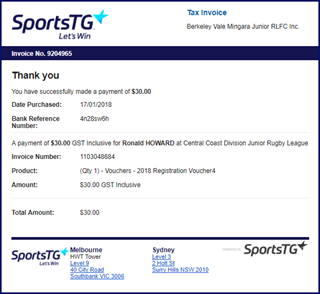 SportsTG is building the functionality for NSW vouchers to be accepted online when registering children into a sport. The registration process is not changing. You can still register multiple children at the same time and use vouchers for all of them. The only change is adding and validating the voucher before checking out. Each voucher has a value of $100. There are several different scenarios possible for using the voucher. If a registration fee is over $100, then $100 will be deducted from the cost of the registration fee. If a registration fee is under $100, then the value of the registration fee will be deducted. The residual amount will not be used. If there are multiple registrations fees in 1 order for 1 child, such as a state and club registration, the $100 will first be applied to the most expensive registration fee and the remaining, if any, will be applied to the next registration fee. If the total of 2 or more registrations fees for 1 child is over $100, then the full value of the voucher will be used. If the total of 2 or more registrations fees for 1 child is under $100, then the value of the registrations will be deducted. The residual amount will not be used. 3. How do I register using a voucher? - Login to the registration form for your sport the same way you have done in the past. - Select how many children you are registering. - If you have registered the child previously, select the name from the list. - If this is the first time, select New Member. - Complete the form with all the mandatory details. - Select the registration product(s) applicable. - After you select a product, the voucher screen opens. Click Validate. You get a confirmation that the voucher has been validated. NOTE: If you don’t validate the voucher, it won’t apply. Select a payment option. Enter the details and click the Pay button. The invoice emailed to you will show everything purchased. Ronald used a voucher to pay part of his $130 registration. Jane used a voucher to pay for her $30 registration. 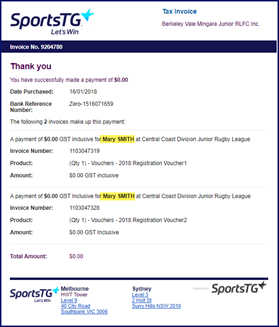 Mary used a voucher to pay for her 2 registrations: 1 at $30 and 1 at $65. Both totals are under $100, therefore, there is nothing to pay. Lawrence and Jonathan each purchased registrations fees and t-shirts. The t-shirts are not claimable under the voucher. Lawrence’s $30 registration was covered completely. 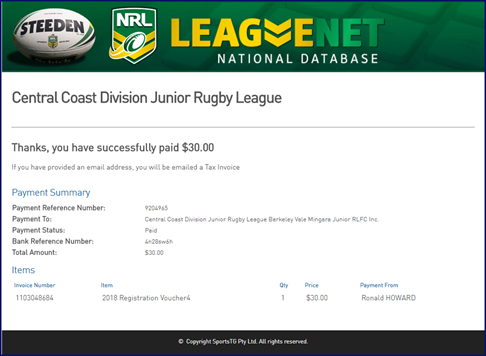 Jonathan’s $130 registration has had the $100 voucher discounted from the price.